Ink on 5x7 inch Bristol board. Monster Portrait Month maybe over, but I'm still working on some of the portraits you guys ordered and its lots of fun! 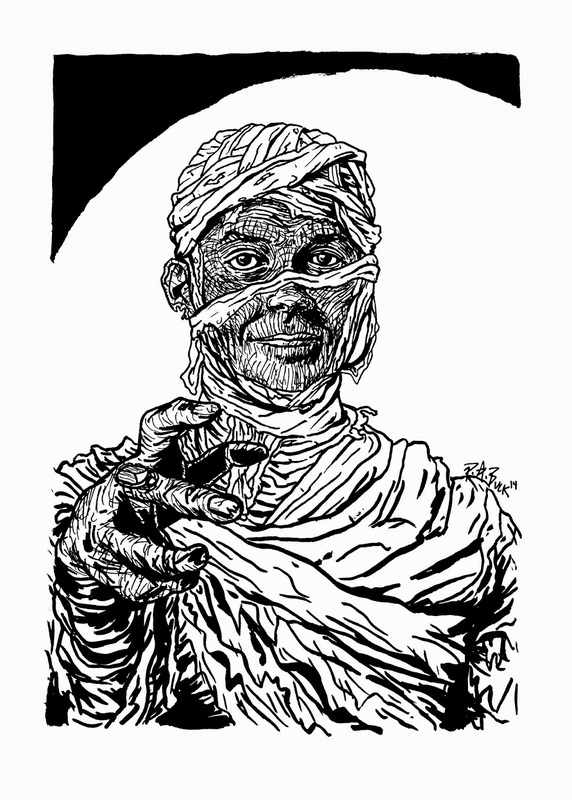 Above is my latest portrait, the terrifying mummy Jonathan!!! This one was tricky, but crazy fun to do! Don't be too bummed out if you missed your chance to order a monster portrait. The sale may have ended, but I still have a couple of ongoing sales over on my online shop, PABshop that may still suit your needs. Feel free to check them out at that link or through the "Shop" page link above and clicking "PABshop." A BIG thanks to everyone who participated in Monster Portrait Month and spread the word! I received a much bigger response than I anticipated. It has been awesome! Thanks for the great help! And another thanks to my sister, Mary for encouraging me to go through with it in the first place and being the first to be Monsterized! Thanks for bearing with me through the many Monstrous ads and stuff on social media lately and sharing them with your friends! And thanks for stopping by the site. God Bless!